It was only a few years ago that selling IT to enterprises was the terrain mainly of large companies like IBM, Oracle and Accenture. And in a market that is forecast to be worth some $3.6 trillion this year, they may still be top dogs, but another trend is also afoot: the growth of the enterprise startup. Growing confidence in the cloud, the falling cost of hosting, the rise of mobile technology and consumerization are all playing their part for smaller companies not only to get their foot in the door with large enterprises but also win lucrative business. Among all the startups and the VC that specialises in startups that I spoke to for this article, all agreed that enterprise startups are generally getting a much better look in against bigger companies when pitching for business with large corporates. Alastair Mitchell, CEO and co-founder of enterprise collaboration platform Huddle, puts this change squarely at the feet of consumerization, trends among employees to bring their own devices into work and the rise of apps. Employees are experimenting at home with new services, so the thinking goes, why can’t they do the same at work? As a result: “Disruptive enterprise startups no longer face a credibility gap in the way we used to,” he says. Alexis Richardson, whose open source-based messaging startup Rabbit Technologies was acquired by VMWare in 2010, says that while that may be the trend among workers, there is a generational change also happening at the higher, decision-making level, which is seeing more risk-taking getting introduced. Adam Marcus, MD of OpenView Venture Partners, a VC firm that focuses on enterprise technologies, believes that credibility has come also with a greater, enterprise-wide acceptance of the lower-cost, software-as-a-service model. “Historically, they would be worried about security and data, but today the SaaS model has actually become more extensive than the traditional on-premise solution,” he says. Another one of the main reasons why enterprise startups are rising up is because they are moving faster at identifying what enterprises need, and solving that, says Mitchell at Huddle . 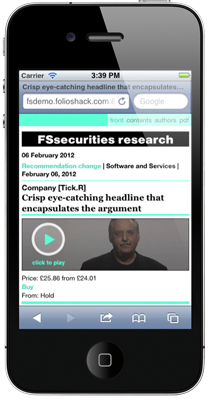 London-based Folioshack has created a publishing platform for investment banks and other verticals to create dynamic presentations for distribution on iPad tablets and smartphones (pictured here). The premise here is that a lot of research today is still “published” using Microsoft Word and Powerpoint, and there is an increasing need to make more user-friendly, dynamic publications for the new wave of wireless devices that bankers and their clients are using, and Word and Powerpoint just aren’t cutting it. One consequence of the rise of cloud services is the impact on cost. It’s gone down — a lot. The lean, cloud-based approach may mean that smaller companies can get off the ground, but some believe it doesn’t really translate to a cost advantage. “Maybe services cloud have made things cheaper, but when you think about it, that’s made it easier for everybody,” says Richardson. Peretti agrees that even with advances, “Enterprise is still harder to get in to for a startup. The minimum viable product is still there, and it has to be bigger and better than you would have in consumer startups.” Part of the reason is because products are not free, and you cannot simply say you are testing in beta as you would for a consumer — although there are a growing number of services, like Box and Hootsuite, that do work free models into their wider business plans, so that might be a trend to watch ahead. Because many of them are seeing recurring revenue from a very early stage of life, the trajectory of an enterprise startup is potentially longer than that for a consumer startup. But on the other hand, the most successful of them potentially might meet a different fate. That of getting, as Mitchell puts it, “taken out” by a much larger competitor. Among the bigger deals are Yammer getting bought by Microsoft and a spate of acquisitions at Oracle and Salesforce. The latter of these, Marcus notes, has been particularly agressive. “Every time any startup gets momentum in the industry that is adjacent to what Salesforce does, it goes and buys it,” notes Marcus, citing Buddy Media as just one of the most recent, high profile examples.